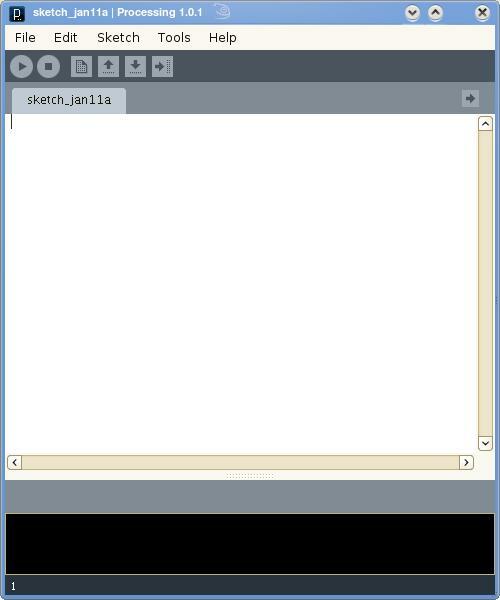 As you see, this is meant to be very simple: there’s a “sketchbook” where you write your code, a toolbar with “Play”, “Pause”, “Export” icons and the usual menu. 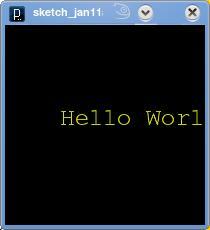 Below the sketchbook you see the “message” area, where all plaintext output appears (useful for debugging your code). The target group of this language/IDE is artists, scientists and generally technical users who want to visualise their ideas. What kind of visualisations? I am talking about 2D or even 3D animations. The workflow is straightforward: you write some C-like commands in the sketchbook area and then you just hit the “Play” button to see the resulting visualisation. 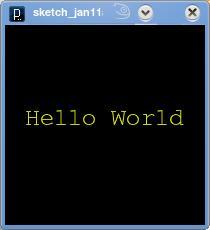 The animations are produced by the underlying Java engine, which is included in the Processing package itself (no need for separate Java downloads). // using the 'Create Font...' option in the Tools menu. // Load the created font. //Set the background color (0-255), 0 is black. These are all very simple, except a very important detail: in Processing, statements in draw() are executed repeatedly, until the program is stopped. Thus, each statement “is executed in sequence and after the last line is read, the first line is executed again”. This is the default behaviour, which I disabled with the noLoop() call.